Professionals plan their winning warm up before they leave home. They understand that weather, equine unpredictability, schedule changes and other factors out of their control can mess up the best laid plans. So well ahead of show day they load the odds of a smooth warm up in their favor by preparing and planning. Here are a few points to consider before you leave the barn so you have a warm up plan that maximizes your horse's performance and reduces your show jitters. Knowing your horse means understanding his personality, particularly his activity drive. Activity drive is like money in the bank when you are showing horses. Horses with high activity drive have lots of energy to spend. Think of a barrel horse or event horse waiting to explode from the starting box. Horses conditioned to a high level of athleticism usually have a high activity drive that must be managed in their warm ups. Nervous, hyper horses may appear to have a high energy drive. But if it is just a show of nerves rather than a display of athletic conditioning, a heavy duty warm up routine may use up their energy and leave them with nothing to spend in their class. Then there are the horses with naturally low activity drive. Label them laid back or lazy, you do not want to spend too much of this horse's energy in your warm up. Warm his muscles check that he is on the aids, and save the rest for his arena performance. Your horse's personality affects his reaction to trailering, to the new horses he finds around him at a show, to all the stimuli at the show grounds that he does not experience at home, and how well he eats and sleeps away from home base. Consider how all these environmental changes may affect your horse as you plan your show schedule. The warm up you ride at a show may or may not be very different from the one you ride before training sessions. Does gender affect how you plan to warm up for classes? It might. Is your gelding a worrier or a stoic who may lose focus under stress? Your stallion who behaves perfectly at home may become ADHD as he tries to figure out where he fits among all the new horses he sees and smells. You may need to plan a longer warm up or a different routine to bring his attention back to you. Mare moods change as they go in and out of season. Do you know your mare's pattern? Will she get to the show and undergo a personality change? You also need to factor physical issues into your warm up. What is your horse's current fitness level? What is his current training level? Do you have a geriatric horse that needs a gentle warm up for stiffer muscles and aging joints? Your horse's age, training level, condition and energy drive will determine how many classes a day he can handle. For a weekend show, ideally you arrive on Friday to allow your horse time to work the travel kinks out of his muscles, settle down in the new environment, and return to as normal a pattern of eating, working, and resting as possible. This is a schedule appropriate for horses that are showing infrequently. If you head to a show every weekend, your horse's experience and physical condition may allow you to do more before your horse's energy drive is spent. Another consideration in how many classes I may enter on a given day is whether I can schedule rest breaks and a proper warm up between the classes. This planning is easier for dressage riders than it is for, say, hunter competitors but do the best you can when entering. Know your horse and his fitness level. Build warm up routines into your training sessions then make them part of your show ring warm up. Have a plan and stick to the plan. The familiarity will help your horse relax and focus on your aids more easily. Even better, if you get caught short of time, running through even a shortened version of your full routine will feel familiar to the horse and help him get into 'the zone' before he enters the arena. Your warm up routine should stay with the familiar, with what the horse already knows. This is not the time for schooling (even though some disciplines refer to the 'schooling ring'). Try not to focus on your surroundings, just focus on yourself and your horse. Develop warm up routines at home but be ready for circumstances like weather or class cancellations that can abruptly change the best laid plans. If your class is called early, be ready with a 'short program' warm up routine you can do in 5 to 10 minutes and be ready to go. 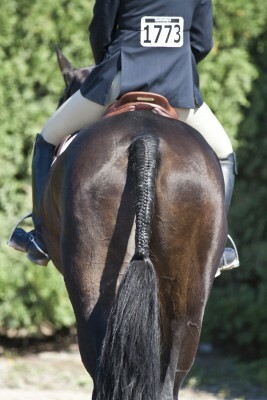 However, stay calm and do not let the changed circumstances create a sense of anxiety that you transmit to your horse. Incorporate bending, leg yielding, walk-to-halt transitions, transitions within the gait, (collecting, then extending, then collecting again) and other exercises that can help your particular horse quickly ready his mind and body for the class. Your turn! Let us know what do you do to prepare for show day in the comments below. I love the Meredith Manor program. It's given me so much in terms of skill and confidence, it's incredible!